Let’s face it ~ we’ve all done the typical hotel stays. Some better than others but, hotels are hotels. Why not opt for a stay in a hip, retro, stylish and super comfy Airstream travel trailer turned hotel? 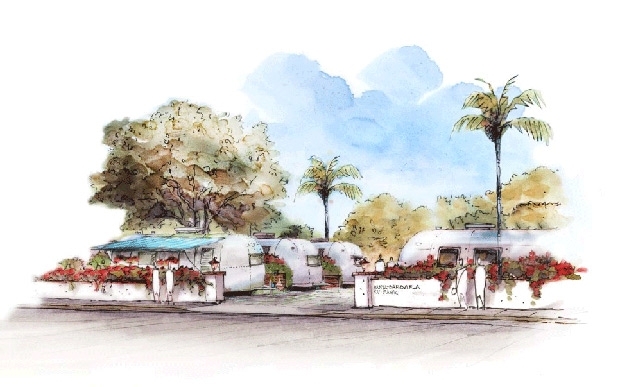 I have searched the world to bring you information on Airstream hotels and I’m so thrilled to have learned about this revitalized concept: Santa Barbara Auto Camp. I contacted Wally Hofmann and he was so gracious to share with me the history below and all of these magnificent photos. I have promised Wally that I will for sure be stopping by on my next trip to California. So, give up the hum-drum hotel stay and book yourself into the coolest lodging in Santa Barbara. You will then experience for yourself what all the hype is about when it comes to the iconic American Airstream travel trailers! Happy Glamping in 2013! Great article published by the Santa Barbara Independent! A unique and luxuriously nostalgic lodging experience awaits travelers to California’s Central Coast. Ninety years of history have been resurrected with the restoration and reopening of the historic Santa Barbara Auto Camp located in the heart of Santa Barbara, just a 15-minute walk from the old Santa Barbara Mission. For the past month, neighbors have been admiring the re-landscaped park entrance that features four smartly renovated Airstream trailers. The SB Auto Camp is part of an existing RV park that houses 30 other trailers from varying manufacturers. Several dozen local residents live full-time at the park – some have called it home for more than four decades. The Airstreams are now available for nightly rentals online. The SB Auto Camp is located a short bike ride southeast of Santa Barbara’s bustling Downtown shopping district. Major shopping centers are within a half mile and quaint local shops, services and eateries are next door and across the street on De La Vina. In 1915, visionary Santa Barbara City Councilman A.W. Dozier embraced the notion that motorists would stop for the night on their tour of the Golden State’s central coast. He believed that motorist would “lay in a supply of groceries, take in our theatres, spend a little money and get an idea of what Santa Barbara really is.” Within four years, the City of Santa Barbara opened a campground for visiting motorist. In 1922, the Santa Barbara Auto Camp was opened at its current location. Today, as in the past, Central Coast travelers are attracted to a road-less-traveled mindset. By the mid 1920’s, the travel trailer had yet to be invented, so motorists adapted their cars into custom-made “caravans” in search of solitude and adventure. Longtime residents know the rich history of this secret pocket of Santa Barbara, but not many know how thousands of travelers camped in farmer’s fields and along hidden creeks, to spend the night during their trips up and down the Pacific Coast Highway. The blended goal of drawing travelers back into town, while protecting the fragile ecosystem surrounding Santa Barbara, is what created this rural oasis along Mission Creek in 1922, and it still does today. For millennia, fresh water springs from Cathedral Park have fed Santa Barbara’s Mission Creek. The sleepy creek, seasonally wet or dry, meanders through Mission Canyon, past the historic Santa Barbara Mission, continuing to the SB Auto Camp where it lingers demurely in still ponds along this tree-covered setting. Each Airstream comfortably sleeps four people and has been locally renovated in Santa Barbara with sustainable construction methods and materials. The units feature all new, all-electric appliances, home-style fixtures and creature comforts found in luxury lodging. Each Airstream also comes with its own outdoor barbecue grill and complimentary use of two retro-styled Huffy beach cruisers and riding helmets. The SB Auto Camp is working in harmony with the existing park residents. “We want to cultivate a truly local experience for our nightly guest, so we’ve welcomed all long-term residents to stay,” says park manager Ryan Miller. Four vacant spaces a the park were filled with four renovated vintage Airstreams. A fifth space will be available in early 2013 with the departure of another resident. For reservations and information, click here. Special Grand Opening Rates starting at just $118/night midweek – weekends are just $150/night. For more on Santa Barbara’s auto transformation, see The Way It Was, by Hattie Beresford, published in the Montecito Journal on August 31, 2006.